It’s official. All three goaltenders that will be wearing the Red, White and Blue in Sochi have received their masks for the 2014 Olympic Games. Jimmy Howard was the third and final recipient as Ray Bishop delivered his freshly painted mask to him today. 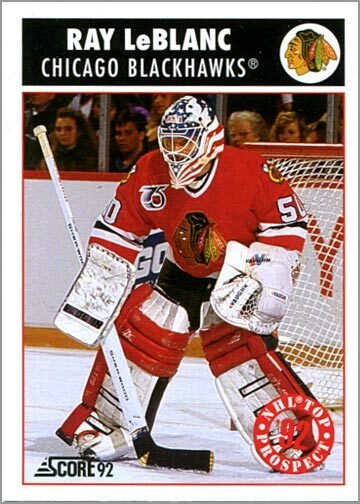 Howard’s mask is a very basic USA design that’s somewhat reminiscent of Ray LeBlanc’s helmet from the 1992 games. While I followed Howard’s mask through the painting process I had high hopes based on the partially painted pictures Bishop Designs was providing on their Facebook page. The sharp, angled lines had the potential to really pop with the rest of the design based on what was being teased. Ultimately I think it only falls short with the placement of the bald eagle on the top. I’m a proponent of profile views or nothing when it comes to eagles on masks. Blame Ed Belfour if you must, but the straight-on shot of the bird’s head doesn’t really do it much justice. In fact, it gives it sort of a funky chicken look. Otherwise, the helmet looks awesome. As basic as most of the design may be it plays perfectly. I’m nitpicking when it comes to the eagle on the top because I think the simplicity of this mask ends up winning me over elsewhere. It’s clear that Bishop and Howard were both well aware of the hurdles that need to be cleared when it comes to the IOC’s standards. I’d have to slot Howard’s mask in as second to Ryan Miller’s on the team this season. Miller’s 2014 mask is nearly identical to that of the one he wore in 2010 but with a few specific changes. He first went with a navy blue base as opposed to the ice blue on his mask from 2010. The change to a navy base triggered a change from blue and red stars to just red stars on the mask. He also went with the Team USA jersey shield on the chin as opposed to any logos associated with Sochi along with a change to the backplate. The backplate change is a slight downgrade in my book, but the back of his masks have always been family and personally motivated, so I don’t discredit him for the choices he made. Elsewhere, Uncle Sam is holding a Sochi torch for this year’s games and the shamrocks a bigger and more noticeable on this year’s mask. The blue base is really what makes this mask so awesome. It is a great match for the US uniforms and it serves as a much better backdrop for both the eagle and Uncle Sam. While the ripping talons on the eagle on his 2010 mask stands out much more than this year’s there are no other downgrades in terms of design when comparing the 2014 mask to the 2010 version. 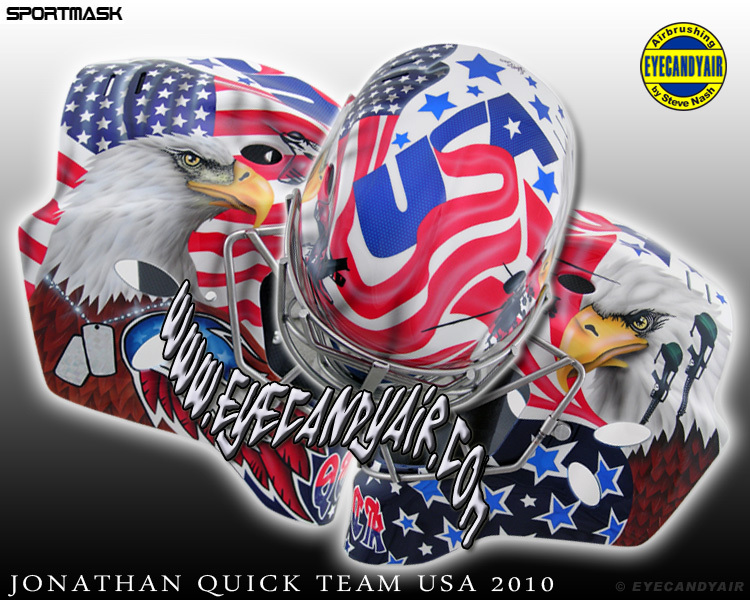 What’s more is that the American overload on this mask sets it apart from the masks of Quick and Howard. Quick’s mask, especially when compared with his 2010 mask, is the black sheep of the group. While his 2014 Olympic mask is a cool American take on his Kings mask, the details are so understated that I don’t think it stands out enough to draw your attention to that fact that it is indeed a US mask. Granted, the addition of the Tomb of the Unknown solider is the best feature of any of the US masks by a mile, I don’t think enough of any of the other details for the backplate to elevate this mask above Howard’s or Miller’s. I like that both he and Miller incorporated the crest from the American uniforms onto the chin of their masks as I think the shield logo looks awesome on both the masks and the jerseys (even if the white jersey looks like a Gap t-shirt). On the bright side, there doesn’t appear to be anything on his mask that will require being taped over like his and Tim Thomas’ masks did at the Vancouver games due to their inclusion of the USA Hockey shield. As of now it appears as if Quick’s mask will see the lion’s share of action as the tournament begins but I’d expect Miller’s mask to make at least one cameo, if not more before the tournament is out. Add your vote for which Olympic mask you like best below or in the comments. Also, go to InGoal Mag for other mask related news as they have a breakdown of Jaroslav Halak and Kari Lehtonen among other masks for the Winter Games.